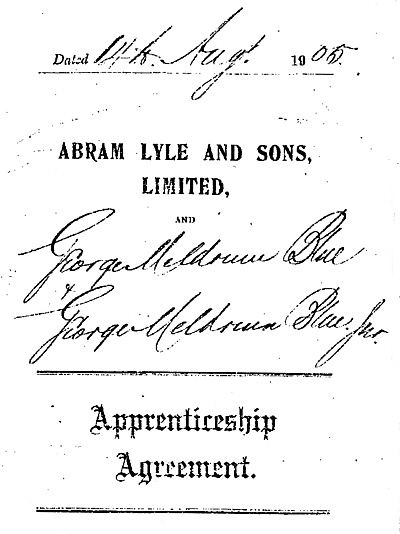 On 14th August 1905, George Meldrum Blue, originally from Greenock and himself an engineer at Abram Lyle's refinery at Plaistow Wharf, Silvertown, entered into an agreement with John Lyle, managing director, regarding the apprenticeship of his son George Meldrum Blue, junior. At just 14, young George was to follow in his father's footsteps and train as an engineer. The papers shows that the Blue family lived at 22 Knights Road, West Silvertown, West Ham, Essex, and that the apprenticeship was for 6 years during which time "... the Apprentice shall faithfully serve the Masters, their secrets keep ...etc." ... though the wages would not be paid for any period of absence whether it be illness, accident, holiday or any other cause. 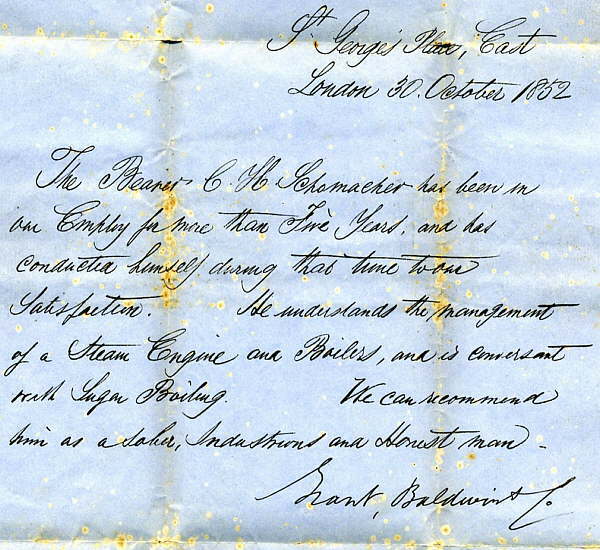 The indenture was eventually signed and sealed on 23rd January 1906 by George, his father and John Lyle, and witnessed by John Galbraith and Walter Hudson. George Meldrum Blue, jun, served his full apprenticeship and on 28th June 1912 was handed his papers to which John Lyle had added a short testimonial ..."George Meldrum Blue completed the within indenture to our satisfaction and showed himself to be honest, sober, industrious and a good tradesman during the time he was with us." George continued to work as an engineer, both locally and in Canada & USA, but not in the sugar industry. My thanks to Chris Eddington. This would appear to be the testimonial with which Claus Schuhmacher left his employment with Grant, Baldwin & Co in London in 1852. He spent the following 3 years in the West Indies, returning to become foreman boiler at the newly established Sankey Sugar Works in Earlestown, Lancs.